The ACNM business meetings are an excellent opportunity to see how ACNM works, learn about current issues affecting midwifery, and help shape the future initiatives and the priorities of your professional organization. Business meetings are open to all members, although voting privileges are not extended to associate members or students. All members are permitted to voice their opinions in accordance with the business meeting procedures. Your opinions are highly valued. If you’re new to association business meetings, the idea of submitting motions may be intimidating. The following frequently asked questions, based on Robert’s Rules of Order Newly Revised and ACNM bylaws will help demystify the process. A motion is a formal proposal by a member, made in a meeting, upon which the College takes a certain action. The proposed action may be substantive (eg, ACNM should support a single-payer health system or conduct a specific research project), or it may simply express a certain view (eg, all women should have access to nitrous oxide in labor). Motions can also be made in response to written or oral reports by the College leadership. 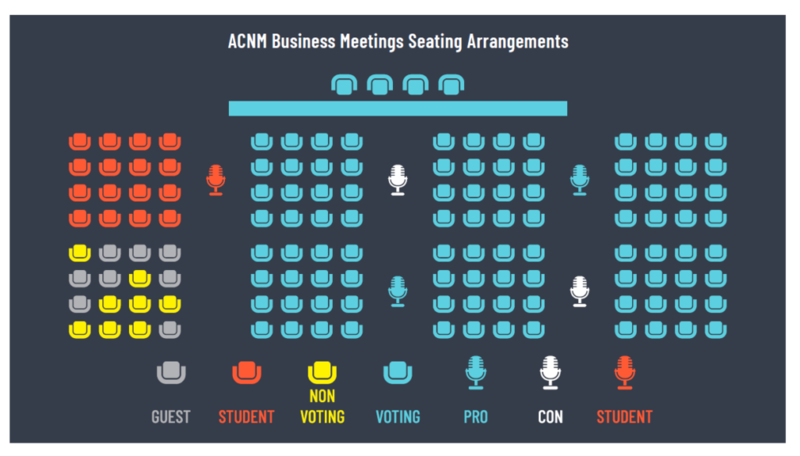 How do you bring a motion to the ACNM business meeting? Members wishing to bring motions to the business meeting should fill out motion forms. A student may submit a motion if an active, voting member is a co-sponsor. Motion forms are due two weeks prior to the Annual Meeting by May 6, 2019 and can be completed online at http://annualmeeting.midwife.org/business-motions/. Who decides when motions will be discussed at the business meeting? If you submitted a motion electronically before the Annual Meeting, it will be numbered in the order it is received. If you submit a motion during the Annual Meeting, it will be considered in the order that it was submitted. Depending on the number of motions submitted and the time available for discussion, some motions may not be discussed during the business meetings. All remaining motions will be reviewed by the ACNM Board of Directors during their post-conference meeting, and the motion-maker will be notified of the outcome of the review. The parliamentarian is a consultant brought in by ACNM to advise the President and other officers, committees, and members on matters of parliamentary procedure. Need Help writing a motion? Monday, May 20 7:00 a.m. – 8:30 a.m.
Tuesday, May 21 7:00 a.m. – 8:00 a.m.
How is my motion brought to the floor? The president of the board invites the member who has submitted a motion to come to a microphone to make their motion. When approaching the microphone, first announce your name and state. The motion itself should be brief, such as “ACNM should support a single payer system.” Then you have two minutes to give your position on this topic. After you have completed your position, take your seat. For your motion to move forward, another member must second it. After the motion is seconded, the chair states the question of the motion, and it is opened for debate by the membership. Are there rules for debate? Yes! See additional rules in the Business Meetings Procedures section below. Once debate has ended or a motion to end debate (calling the question or moving the previous question) is adopted, members have the opportunity to vote on the motion. Can discussion take place without a motion? The general rule is that a motion must be made for discussion to take place on an issue unless it is permitted by the chair. This rule helps to keep the meeting on track. ACNM staff, board members, and our parliamentarian are available to assist you. Email us at motions@acnm.org. Is a set percentage of attendees required at the Business Meetings for votes to take place? In other words, one-third of the number of voting members registered at the Annual Meeting on each day of the Membership Business Meetings is a quorum. Attendees who may have registered for days other than the days that the Membership Business Meetings fall on are not counted. Only members who have registered for the full meeting, or daily conference attendees who are registered on the days of the Membership Business Meetings, are included in the total voting members count. For example, if 2000 registered conference attendees that will attend the entire annual meeting – 1350 voting members, 500 students (who are not voting members), and 150 other non-voting attendees, what’s needed to form a quorum is 450 voting members (1/3 of 1350) in attendance. The bottom line: This is why attendance of every member at Business Meetings is critical. It ensures that voting can take place. Registration: All members and guests must be registered for the Annual Meeting before attending business meeting sessions, and identification badges must be worn at all times. Discussion: When addressing the president, a member shall go to a microphone and give his or her name and state. Members shall not speak more than twice on the same subject and shall be limited to two minutes each time. Members should speak at the microphone appropriate to their viewpoint or status (microphones are labeled Pro, Con, and Student). Persons with disabilities may speak at the microphone convenient to their seating, taking care to disclose their viewpoints or status at the outset of their remarks. No person shall speak a second time until everyone who wishes to speak for the first time has been recognized. In debate, active members shall be recognized first, followed by associate and student members. Student members will be allowed to speak at the microphone in proportion to their representation, related to representation of active members. Reports shall be limited to three minutes. A timekeeper shall signal to the speaker when allotted time has expired. The microphone will be shut off when the three-minute time frame has expired. Motions: Motions proposing new business shall be presented in the proper format and in the order in which they have been filed with the parliamentarian. Should a proponent of a motion not be available when the motion is presented, the motion will be placed last. Official forms used to propose motions will be available in the Program Committee office (first floor, Greene Boardroom). Announcements: Because of time constraints, announcements can only be made from the platform and must relate to the ACNM education sessions, meetings at which ACNM business is being conducted, or the overall business of ACNM. All other announcements should be posted on the message board or sent through the ACNM Annual Meeting app. Authority: Robert’s Rules of Order Newly Revised govern the proceedings of the business meetings in all cases not covered by ACNM bylaws or these procedures. Recording: Audio or video recording of business meetings is not permitted unless authorized by the president.